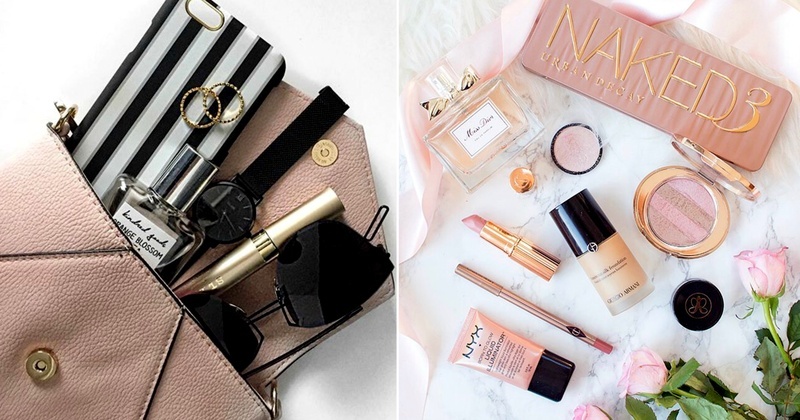 10+ Makeup Essentials every bride should carry in her purse! A lot of brides spend all their time planning the before and after of their wedding so much so that they forget all the things the little but important things they need to keep handy during these functions. So, in order to make things a little easier, here is our guide on must-have essentials a bride should carry in her purse! This one’s for all the pouting, talking, eating and never ending selfies a bride goes through on her wedding day! So, make sure you have a tinted lip balm in your purse as it not only refreshes the color on your lips, but it also keeps them well moisturized! We recommend keeping the same shade which your makeup artist applied on your face. It’s quite possible that with today’s makeup products and setting sprays, a touch up won’t be required at all, but it’s always better to be safe than sorry. So, pop a compact into your bag and relax knowing it is there if you need it! Simply put, these guys are a game changer. When used right (NEVER use your sponge dry), they’ll help you with any makeup corrections needed and make you look flawless in all your bridal portraits! There's absolutely nothing better than a fabolous highlighter to give you that lit-from-within bridal glow. Seriously, it's really about choosing the formula that's right for you, whether it be a powder, balm, or liquid. Whether you're looking for extra volume or lengthy lashes, a mascara is an absolute necessity in your purse. We recommend a waterproof formula to avoid any smudging or flaking in-between photos. Your lipstick serves as the finishing touch to your makeup look, so it’s a staple in your bridal beauty stash. Also, they’re small enough to easily fit in your bag, so why not pack both your day and night shades? We say, keep a fresh and natural shade for the day and bold and deeper shade for the night! This one’s an important essential, so make sure you don’t forget to keep this in your purse! It’ll make you smell amazing all day long. So, spritz on some extra and you’ll remember this scent forever. The nostalgic fragrance will even make it a perfect anniversary and special occasion use too! These babies will keep your oily face at bay and your makeup intact. So, stack up your wedding purse with some blotting papers and even better if you get your hands on the powdered ones as they are good for touch-ups. Every strand of your hair needs to be in place on your wedding day. So, keep ample of bobby pins handy and even better if they match your hair colour of the moment! It impossible that there won’t be a makeup smudge, chai or wine spill or food stain amidst all the love, excitement and merriment of a Indian wedding affair. So, keep those stains at bay by packing some instant stain remover sticks in your bag. Get a pack of these in various sizes. They will come in handy for just about anything, especially for any unwanted wardrobe malfunction. It’s possible you might either be eating something cheesy or fried since morning or might have forgotten to eat anything at all. In either case, these breath mints will come in handy! And just to be on the safe side, bring along a small pill box that contains pain relievers or other medications that you might need (i.e. allergies). Also, pack a few band-aids for any mishaps with your wedding shoes. Sounds too much? Well, the key here is to bring handy packs of all the products, so not everything is jammed in your precious wedding purse. Also, you do not need to carry your wedding purse with you always. You can obviously entrust this to your sister, mother or any of your bridesmaids , just make sure to pack these a day before your wedding day.